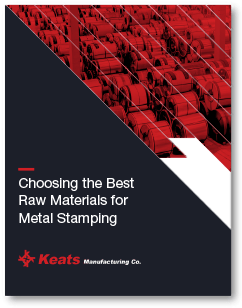 Choosing the Best Raw Materials for Metal Stamping eBook | Keats Manufacturing Co.
processes in the world. With recent improvements in technology, metal stamping allows for cost-efficient bulk production of parts with highly repeatable levels of accuracy. However, for a part to function as designed, it’s essential to start with the right raw material. Metal stamping is one of the most widely used manufacturing processes in the world. With recent improvements in technology, metal stamping allows for cost-efficient bulk production of parts with highly repeatable levels of accuracy. However, for a part to function as designed, it’s essential to start with the right raw material.